2007. 128 pp., 92 col. pl., 22 x 23 cm., softcover. MYANMAR-BORN MOE MIN had long dreamed of taking to the road, exploring every corner of his homeland and coming back with images of both the marvellous and the simple, in the daily lives of its people. 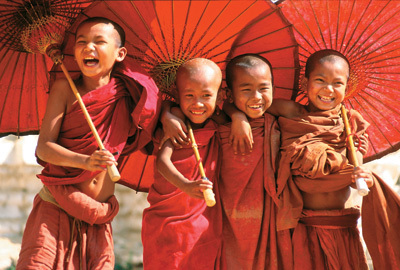 But the demand for this kind of photography barely pays enough to fill your rice bowl in Myanmar, so the budding photographer developed connections to more lucrative international outlets. 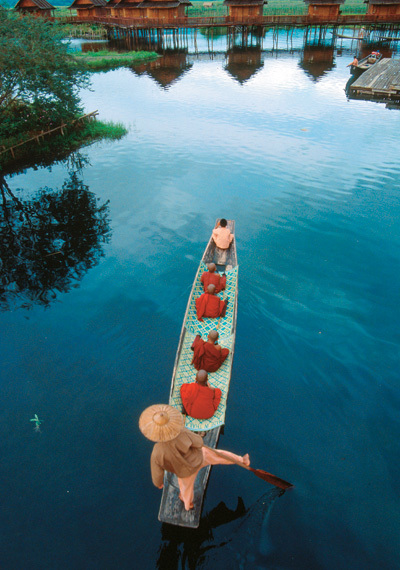 He set up a commercial business on a leafy lakeside in Yangon and began to shoot ads, models, posters and calendars. His Cosmic Ray Studio is now the country’s largest photographic agency and its financial success has enabled Moe Min to pursue his true passion. 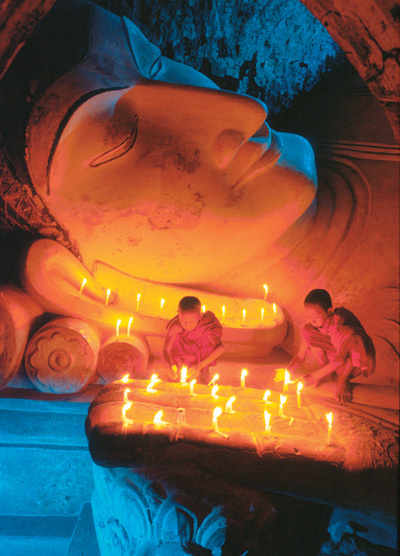 The new book, In Buddha’s Land: Visions of Buddhist Myanmar, published in May by Orchid Press, is the result of his lifelong ambition. Moe Min’s international book debut is a stunning depiction of the religion which dominates the landscape, history and daily life of the Myanmar people. 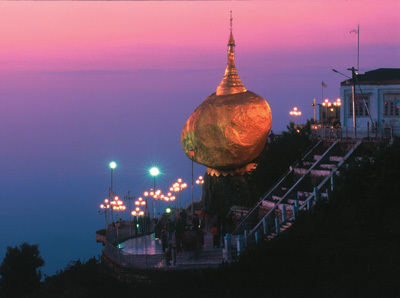 This is a land of monks and pagodas. 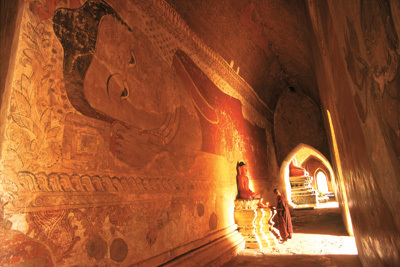 Images range from the great Buddhist shrines in Bagan, Sagaing and Yangon to colourful ceremonies and private moments of deep spirituality. 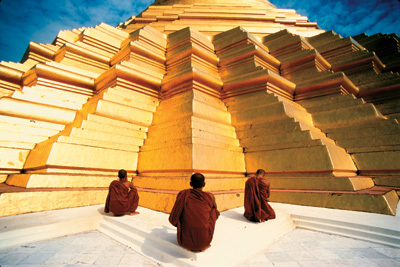 A monk is caught by Min’s camera pressing fervently against the grand Golden Rock Pagoda, immersed in deep prayer. Elsewhere, jovial novices play with cats in their monastery. 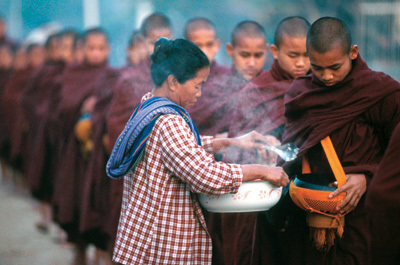 Like most folks in Myanmar, Moe Min grew up imbued with Theravada Buddhist philosophy and ritual. Born in 1959 into a family of merchants in Pyaw Bwe, a small town near the old royal capital of Mandalay, he left for Yangon at the age of 14. The artist in the family was his older brother, a painter, and Min spent a good deal of time with him and his circle of friends. “I also wanted to be an artist, but it turned out that I couldn’t paint,’’ Moe Min says. So at the age of 16, Moe Min turned to photography, working his way from portrait shots that accompanied magazine interviews, to cover images and then to contributions to photography books. From 1980 onwards, whenever he had some loose change in his pocket, he would head out into the Myanmar hinterlands with his camera. Moe Min studied physics at the prestigious University of Yangon, yet never put his degree to any professional use. Instead, he took a basic photography course at the Myanmar Photographic Society, one of the country’s few non-governmental organisations with some 10,000 members, including 200 to 300 professionals and active amateur photographers. 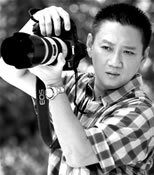 Decades later, and now regarded as one of the country’s top photographers, 48-year-old Moe Min gives back some of the knowledge he has acquired to the new generation. 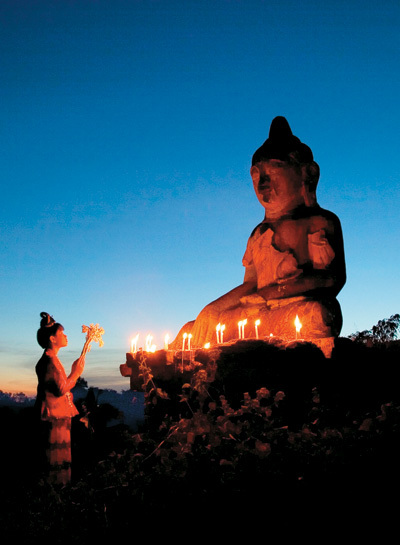 In Buddha’s Land: Visions of Buddhist Myanmar could also be viewed as an extension of this teaching, a way to educate the world about the beauty of his homeland. Here, in his own words, Moe Min describes eight of his favourite images from his new book. Monks pray at the upper terrace of Yangon’s Shwedagon Pagoda, one of Buddhism’s most magnificent edifices. I took the picture because I liked the structural lines under the bright light, enhanced by the wide lens at a low angle.